Now you and everyone else at home can charge your devices at the same time without taking turns! 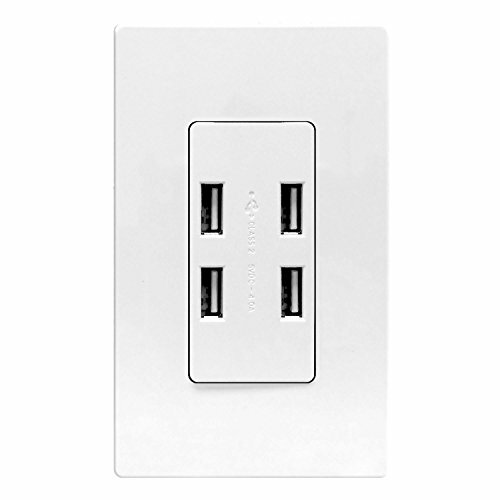 Enerlites 62000-4USB 4-Port USB Charger Receptacle is a wall outlet with four USB ports that allows you to charge multiple devices simultaneously without power adapters. Charging is more convenient and efficient, especially for you and your busy schedule. Charge up to four devices at the same time and make charging more convenient and efficient. The USB ports have a total output of 4A, 5V, with an output of 1A per port. Enerlites 62000-4USB 4-Port USB Charger Receptacle can be easily installed in the wall of your bedroom, living room, kitchen, and any other room to make power charging fast, easy and convenient. Your iPad, iPhone, tablets, Samsung Galaxy, and MP3 player now have a better power center, and your room will always look tidy and neat. This USB charger outlet is also great for commercial usage, including airports, hotels, restaurants, schools, offices, hospitals and more. The receptacle is back and side wired for broad compatibility with diverse wiring needs. The product can fit in any standard in-wall outlet box. The outlet includes two wall plates, one in a screwless decorator style and the other a traditional decorator style. The outlet complies with 2011 National Electrical Code (NEC) requirements. UL-listed and ROHC compliant.